My travels along the Ancient Tea & Horse Road led me to Weishan Village, which is a two hour drive south of Xizhou Town, where the LINDEN CENTRE is located. Weishan was an important and prosperous trading place during the 8th and 9th centuries and the old-town village is very picturesque, with friendly and laid-back shop merchants lining the streets. I was lucky to be here on the last day of the famous Weishan Snack Festival, which draws people from all over Yunnan once a year to gather together and eat all sorts of unique snacks. I tried some spicy dried ginger, and also a candied nut snack that reminded me of homemade turtle candy…only without the caramel, and not quite so sweet. I ventured into several antique stores, which were packed with treasures of all shapes and sizes. I was so drawn to the stacks of old hand-bound books, some were illustrated, some were not, but all of them were filled with lines of beautiful Chinese writing. I tried to guess what they might be about. Further along my walk, I saw a sellers stall filled with lovely ceramic bowls and cups. I purchased three small blue & white bowls that I know my children and I would treasure at home. The Village of Weishan is also famous for being the location where the longest handmade noodle in the world was created, so of course we needed to try the noodles too! I really enjoyed the slices of ginger you could add to your noodle bowl, along with the rustic chopsticks at this restaurant. After lunch, I wandered through an outdoor bonsai tree garden and was amazed at how much personality each bonsai had - they are literally living works of art. 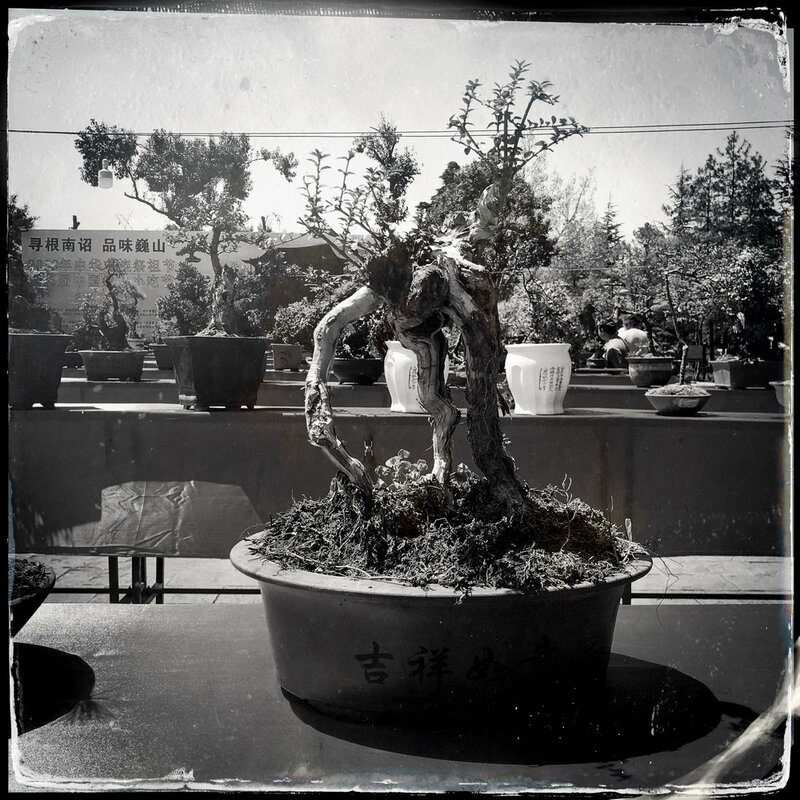 I admired how each planter was different and enhanced the personality of the bonsai tree. I couldn’t help but think about the many generations of people who have cared for these beautiful trees. Not far from Weishan, is another famous landmark - Weibaoshan Mountain, with its stunning series of Taoist and Buddhist temples. We traveled about an hour up a narrow winding road to reach the entrance. As I made the pilgrimage, step by step, up the stone stairs that led to the temples, I marveled at the towering forests with many huge ancient trees that were whispering gently in the wind. The atmosphere on the mountain is so peaceful, I could have stayed there all day, sketching in my sketchbook, and breathing deeply. As I wandered through several of the first temples along the path, I picked up two bright yellow leaves that had fallen, and started making some double-exposure images. I wanted to layer myself with the peace of the forest, and the leaves that had these beautiful spots or “Islands” on them. When I heard that there was one temple on the mountain dedicated to a 400 year old camellia tree, I knew that out of all the temples, this one with the rare tree would resonate with me the most. So I set out to find it. During early February, hundreds of bowl-like and red like rouge camellias are in full bloom on this 400 year old camellia tree. I’ve been very conscious of the idea of yin and yang, since I arrived in China, and have been exploring this philosophy of balance and harmony in my photographs since I arrived here. When I saw the beautiful yin yang symbol painted on the entrance doors of the Camellia Temple, I knew it was going to be a special place. As I walked in, it felt to me like time had stopped. The air was so still and sweet, and and there blooming flowers and plants everywhere. Nothing compared though, to the sight of the Camellia tree standing in the center of the temple courtyard. As I stood below her and gazed up, I was enthralled. Again, I felt like time stopped, and that I had stepped into Eden. A Taoist monk was present, lighting coils of pink incense that burned with delicate tendrils of smoke. He gestured me to a seat, and gently poured me a cup of tea. Then he started quietly speaking to me. Even though I couldn’t understand what he was saying, I caught the meaning of his heart which shone through his eyes. He was telling me that this was a place of sacred healing, and that I was welcome to stay there as long as I needed to. As I came down the mountain, I met several other members of my photography group and we sat by a tiny stream and talked about what we had seen. Some of us had toured the temples, others had gone off on forest paths. We all made photos, and I think all of us deeply felt the peace and tranquility of this place. If you’ve ever experienced a sacred place like I did at the Camellia Temple on Weibao Mountain, I would love to hear about it! I hope these images inspire you to keep looking deeply both inside, and out, wherever you find yourself today. I am diving deep into my photography retreat in Yunnan with Douglas Beasley, and I can’t wait to share more about what I am learning, and why the ancient beauty of China is so appealing to me. My heart is FULL of gratitude for this quality time with my art!